How do I delete a person? Is there data deleted? When a person is deleted their data is indeed deleted. If a person leaves your organization or you want to revoke a person's ability to login we strongly recommend setting the user to inactive. Inactive users cannot login but their legacy time data, task data, etc. is still available and they are immediately logged out. You can always reassign their tasks if needed. 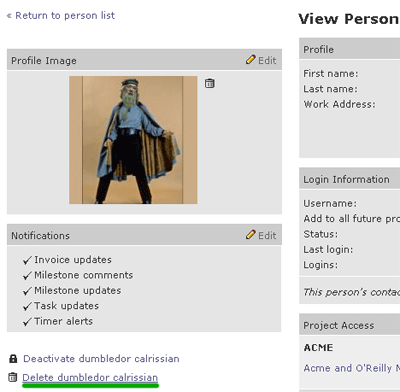 When a person is deleted their time data is deleted and any tasks, projects, milestones, etc. they own or are assigned will be moved to the person that is performing the deletion. 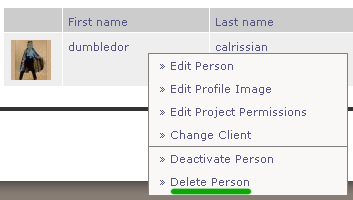 Most delete actions work in a very similar fashion where you can right click on the listing or view the detail page. This is true for clients, projects, invoices, etc.